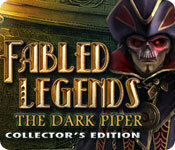 Fabled Legends: The Dark Piper Collector's Edition is rated 4.2 out of 5 by 105. Rated 5 out of 5 by orijojo from BOY OH BOY! WHAT AN AMAZING GAME, WHAT A GREAT CHALLENGE. Rated 5 out of 5 by pennmom36 from Fabled Legends: The Dark Piper CE Once a year the small town of Hamelin celebrates the Pied Piper Festival in honor of the hero who played his pipe and lured the rats from the streets into the river! This year someone must have made him mad, the pied piper has returned with a vengeance, bringing with him millions of plague infested rats! The Pied Piper is now known as the Dark Piper, and it's up to you inspector, to figure out how to stop this madman and rid the town of rats, once again! This game is very similar to the Dark Parables series, same design, same music and most of all the same unique nonlinear Morphs that I adore. Morphing Fable Objects may not morph the first time you see them, it usually requires an action within another scene to trigger the morph, so you will have to revisit areas several time in search of the morph, which makes it so much more challenging! 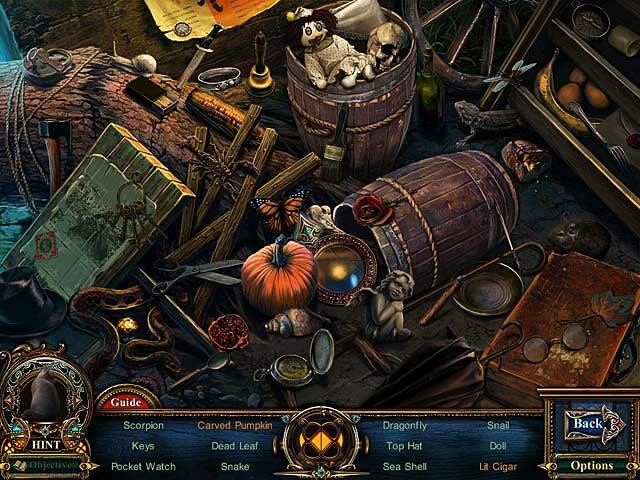 Unlike DP games, the Hidden Object Scenes are interactive list finds, with just the right amount of difficulty. SPOILER ALERT: there are several interactive items in each scene, but not all of them are necessary, just to throw you off track. 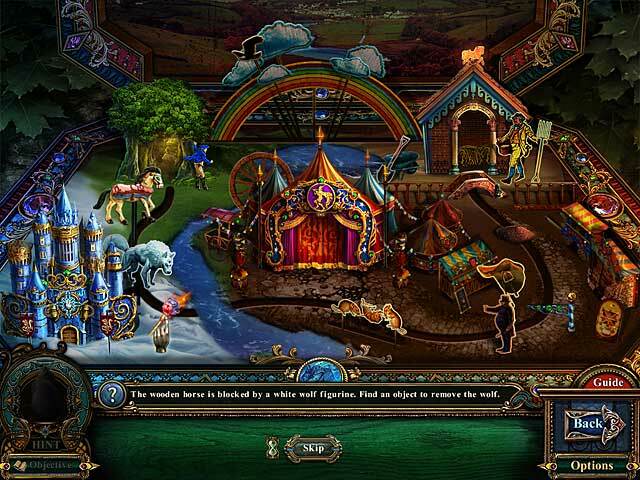 The Mini Games vary in difficulty from easy puzzles such as selecting specific objects in a stage play to allow the wooden horse to return to the stable. The hardest game in my opinion was selecting flower bulbs correctly so that all connected paths would light up. This Collector's Edition has 20 Morphing Fable Objects, 8 replayable Puzzles, 20 Movie Videos, 6 Wallpapers, 6 Music Soundtracks, 18 Concept Art Pictures, a built in Strategy Guide, and a Bonus Chapter The Midas Lair. This is a fantastic game and it is surprising to me that more games haven't been produced in this series, enjoy! Rated 5 out of 5 by splash1234 from A nice adventure game This is a good adventure game with a lot of HOS and mini games. Its a bit dark but you can still see what your looking for. It has pretty graphics and enjoyable to take your time looking around and exploring all the different areas. There is a lot of going back and forth but I didn't mind it because its a pretty game. The music is serene and beautiful.There is a map and a strategy guide. I am glad I bought this game and will play it again in a few months. Play the demo and see for yourself. Rated 5 out of 5 by desiskorm from Definetely a favourite Despite of all the rats, this was a very enjoyable game for me. I found the storyline interesting since I've only heard of the Pied Piper before, but never knew the actual story. Rated 5 out of 5 by rebekkah43 from FUN Fun! Fun! Fun! This game has is mostly hidden objects with only a few mini games. Rated 5 out of 5 by grammakk from great play loved this game.awesome visually love the interactive with touching something and making it move makes it fun,a bit of a thinker to go where you got to with inventory but im not a pro player, stayed up late to see the end of this bought the ce and i try not to do that so glad i did.enjoy. Rated 5 out of 5 by areti7 from An other excellent offer from BLUE TEA Series Fabled Legends.The Dark Piper.I enjoyed this game .HOS,Graphics,Puzzles,story, everything was perfect.Even the darkness in the scenes was giving a mysterious atmosphere .I couldn't stop playing it and the surprise was the Bonus content:THE MIDAS LAIR.just fabulous game with superb Puzzles with nice graphics from the Ancient Greek mythology.So buy this game you will enjoy it. Rated 5 out of 5 by Jlceb from Charming, extraordinary experience The same developer from the Dark Parables series refined their craft, and their offerings this past year have been spectacular. Their art, story, music, and cutscene animations are among the very best of the genre and this dark take on the piper of Hamelin (also touching many other fables) is no exception. If you're a fan of fragmented object scenes, however, you will be disappointed, since they switched here to the conventional object list HOGs. I personally welcome the change (FROG scenes have been abused to the point where you're clicking on minuscule non-descript fragments barely distinguisable from image compression artifacts) although the logic quantum leaps of finding a ton of useful objects only to discard them immediately and leave the scene with a used toothbrush can't be denied. The Dark Piper tries hard to tell a story (including even some character progression and your typical big-but-expected revelation), and gets it right better than most, thanks in no small part to the great character art and design. In my opinion, only longer cutscenes, more read material and a bigger budget could entirely fill the remaining void, and I'm not sure that is a line worth following in the genre. I'd say the game is not difficult but not too easy either, and you'll probably get stuck at some point due to some missed object here and there. The inventory puzzles are the worst offenders, some times stretching the limits of logic. The hint system provided is not good enough for those cases (it won't send you to the right location if there is nothing more to do in the current one, for example). The HOGs are fair, with mostly big and clear objects, although the interactive ones require some real thinking since there are usually some red herrings in the scene (usable or pickable objects that actually serve no purpose). Puzzles are varied and well done, although they fall on the charming-but-too-easy side. The CE is well worth it thanks to the extra chapter. Although somewhat short and featuring only an unconnected, poor story and a lacking villain, it has some of the best backgrounds in the game. Other extra features include the expected music score, concept art, and a few extra puzzles (basically, harder versions of the game's ones). Overall, however, it is an excellent experience, specially thanks to the charming art and immersive backgrounds. Definitively one of my best picks from the past year 2012. The developer is one to follow and I wish they include even more modern features in their next offerings, such as a much-needed teleporting map and a multi-screen aware hint system. Rated 5 out of 5 by sandradolores from My favorite producer of games I bought this, in essence, sight unseen when I noted the name of the producer. Love all their games. I'm on the intermediate level; therefore, it was a challenge for me Probably not so much for you folks functioning on the expert level. I thought the visuals were wonderful and not that dark. My monitor is rather large so that helps.The map did not seem to be of marked value and I missed havng a journal. As a result, I needed to use the guide more than I expected. When I play again, I plan to take notes in order to remember locations and what is needed in each one. I thought the story line was fine and I enjoyed the additional bonus play. The music was okay, nothing spectacular, but not anoying. In summary, I REALLY liked the game, it's HO's, and other features. I highly recommend this one. Rated 5 out of 5 by Dawnanita from Fantastic This is a fantastic game. I purchased the cllector's edition and LOVED it. 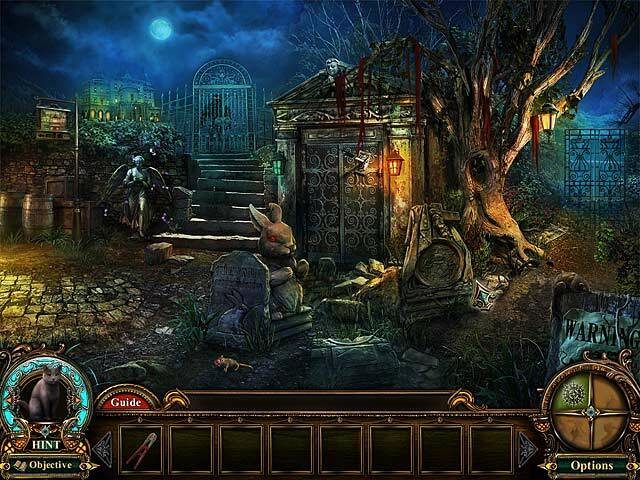 It has a GREAT balance of Hidden Object, Puzzles, and the story keeps you interested. I have nothing negative to say about this game.